Tour en grupo pequeño de 15 personas o menos. 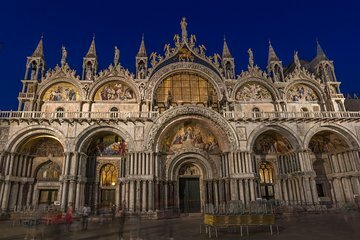 Aprende sobre el papel de la Basílica en la historia de Venecia. Conozca a su guía y un pequeño grupo de solo 15 personas o menos en la Piazzetta dei Leoncini en la Plaza de San Marcos 15 minutos antes de la hora de inicio elegida. Comience por mirar alrededor de la Plaza de San Marcos, aprendiendo sobre los orígenes de Venecia a través del comentario de su guía. Ingrese a la Basílica sin esperar en ninguna línea o empujando más allá de las multitudes. Esta experiencia después de las horas realmente comienza cuando el custodio de la iglesia abre la puerta para los pocos visitantes afortunados. Habrá un máximo de seis grupos pequeños en la Basílica con usted. Visite áreas que no suelen estar abiertas al público, como la cripta. Conozca las obras de arte intrincadas, como el Pala d'Oro, una obra de esmalte bizantino decorada con más de 1,900 gemas preciosas. Vea los 43,00 pies cuadrados (3,995 metros cuadrados) de mosaicos dorados, iluminados solo para su recorrido. Termina tu recorrido después de 1.5 horas de exploración y aprendizaje. Seeing the Basilica in the evening was very special and very beautiful, the lighting made the mosaics more beautiful if that is possible. We went back in the day time to see the museum. Our tour guide was great and very informative. This was our 3Rd visit to Venice. We did the Doges Palace on the first visit but always avoided ST. Marks as it just looked like wall to wall people. A blogger friend of mind recommended this ttour and although pricey it is such a treat and privilege to be able to see inside this unique building. When the guides turn the lights on to see the ceiling mosaics I was awestruck. I'm lucky enough to have travelled extensively over the years and done many tours so am not always easily wowed but I really would suggest you skip the expensive gondolas get in with the locals on the water buses and spend your money on this tour. Our guide, Andrea, was engaging and educational and I came away feeling I understood not only the basilica better but Venice in general too. This is the best tour I have ever been on! Our guide was an architect and this made the tour even more special. We had toured St. Mark's last fall during the day, but this was beyond our expectations. Seeing the Basilica at night was amazing and we felt privileged to be there. It is by far worth the price. You will not be disappointed! This was a life-changing experience. We enjoyed St. Mark's in a way that very few people do...alone! It was quiet, majestic, and spiritually moving, and our guide was awesome. I can't recommend this tour enough. We even got to go down to the catacombs below, which very few people were able to do. Very good tour, we were a group of about 15 who had St. Mark's completely to ourselves. Portico, main church, alter, Pala d'Oro and crypt were included. No rush with a well informed guide. LOVED this tour with Moises. He was so well informed and interesting. The Basilica was amazing when it was all lit up! This is a must do when in Venice, I wouldn't miss seeing this! It was very interesting. The guide knew his information and was very personable. Everyone in the small group seeemed pleased. This was the highlight of our 5 day trip to Venice. It was not cheap but after reading other reviews which had also awarded it 5 stars we decided to book as we thought it would be a memorable experience - which it was. We spent about half an hour outside as it was a beautiful evening, with Andrea our guide talking about various aspects of the Basilica and St Marks Square and then we entered the Basilica. This was spectacular, amazing and magical. There was only one other small group there but hardly noticeable as we didn't cross each other's paths. The moment when the lights slowly came on and the mosaics were revealed was amazing. The tour lasted one and a half hours and Andrea was a very knowledgeable guide full of interesting and amusing stories. I feel privileged to have been there in the evening without all the crowds and wouldn't hesitate to recommmend this tour to others. This was a great tour. The guide knew all about the special golden altar board. She pointed out important mosaics. We only had about 12 people in the tour and she could answer all our questions. The church is Roman Catholic but the design and style follows the Greek Style Architecture. Venice was a strong City State many of the important artifacts bronze horses, St. Marks Relics, etc. were taken from the Eastern Mediterranean.